And where is your God? Normally, in pictures that relate to the Passion of Christ, you expect to see Christ in the forefront. After all, He died to save us, and is rightly the subject of some of the greatest art in Western civilization. Yet… in this art piece, Christ is in the background. Not only is He in the background, but He is in the background in three different places. In the top left, Jesus is being scourged at the pillar. In the top center, Jesus is being displayed with His crown of thorns to the people. And finally, at the top right he is carrying His cross. Yet, that is not the focus at all. Instead, a medieval marketplace is in the forefront. People are displaying and buying their wares, completely oblivious to the Passion that is going on in the background. The people who do seem to be watching the Passion seem to be enjoying it, almost to the point where it seems like there is a celebration going on. 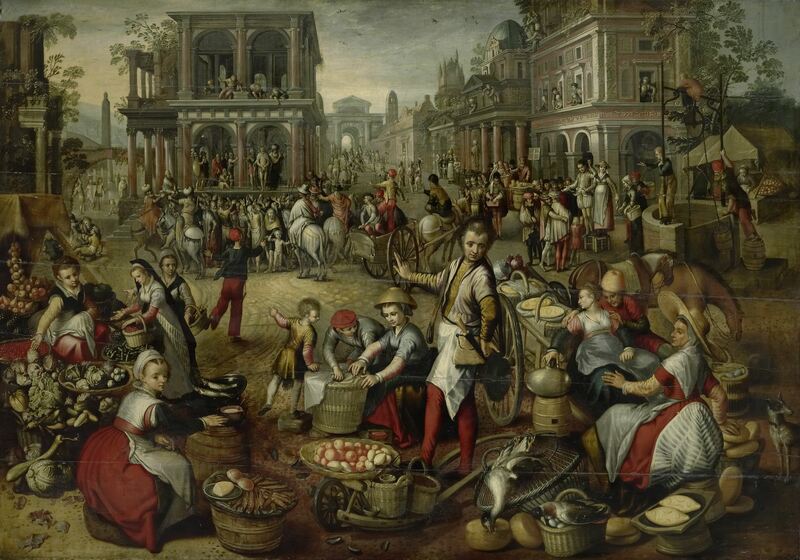 Marketplace, with the Flagellation, the Ecce Homo and the Bearing of the Cross in the background, by Joachim Bueckelaer, c. 1550 – 1590. Rijksmuseum, Amsterdam, Netherlands. But, there shouldn’t be any celebrating. And it seems wrong for people to simply ignore the scene. After all, Jesus is being whipped and beaten and sent to die in perhaps the most excruciating way possible. Everyone should take note of this and weep. Yet, nobody seems to care. And that’s what makes this powerful. The setting is in the medieval town, but it might as well be set in our own modern times. It is too easy, much too easy, to forget about the sacrifice of Christ and continue in our own dealings. I know that, speaking for myself, sometimes I’ll be praying the Rosary and then I’ll lose track because I remember something that I should add to my grocery list. And that will lead to other thoughts about menu planning that ultimately distract me from Jesus. Mind you, having food to eat and a well-maintained household is a good thing. But, maintaining a relationship with Jesus is even more important, as He points out to Martha! After all, He is the Bread of Life! So, as we hasten about our day, let us try to remember Christ and His sacrifice, especially on this day of penance, Friday. Help us focus on you, even in our busy lives. Stay with us and give us opportunities to remember and love you.